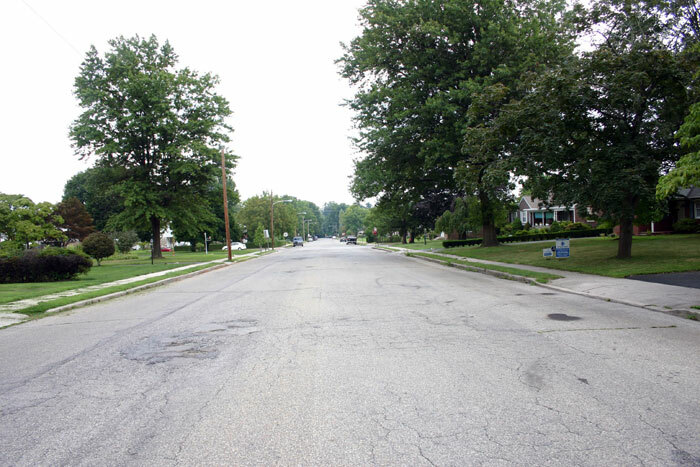 Every American city and town has far more pavement than needed. 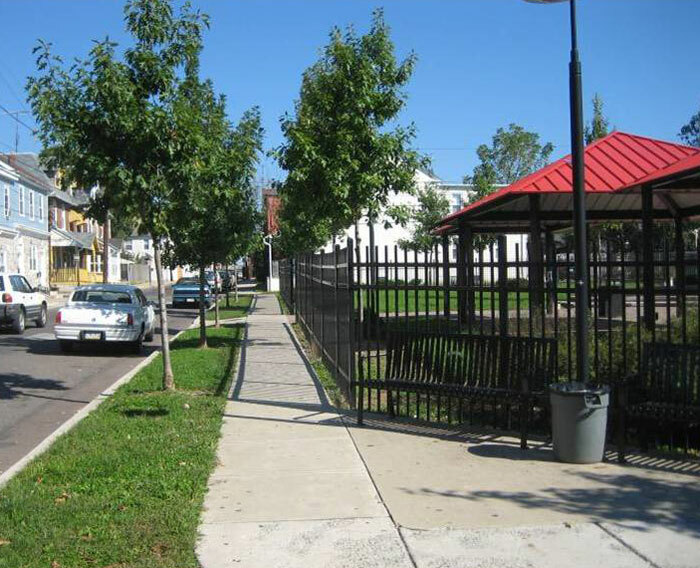 We've paved over much of our land for streets and parking lots, making them all much larger than they need to be. Streets and sidewalks take up about 25 percent of the land in many cities and towns, not to mention land consumed by parking lots. We devote far more land to asphalt and concrete than necessary. An important way to make sidewalks more compatible with trees is to simply rip up excess amounts of impervious surface. 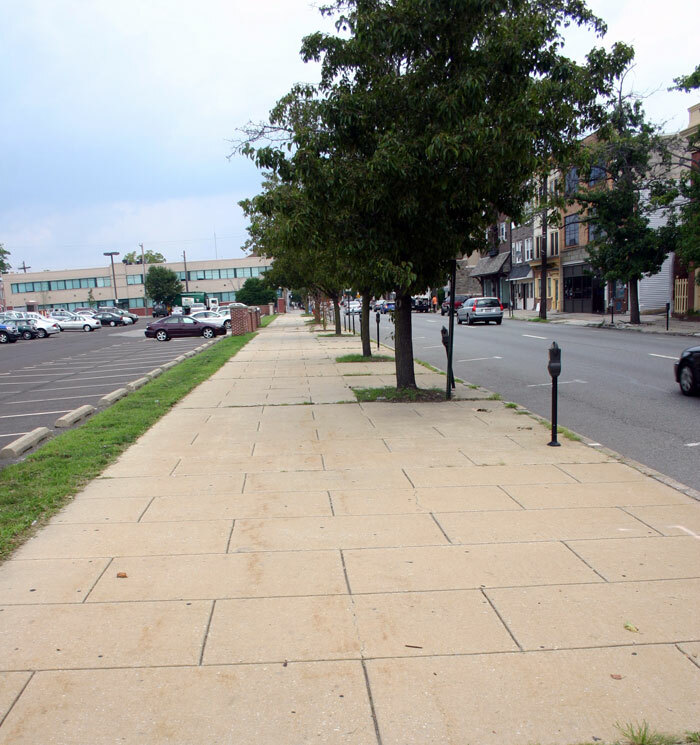 Consider this overly wide sidewalk, above, in Norristown, a small town outside Philadelphia. The sidewalk is wide enough to accommodate a Mahattan-sized crowd, but has few pedestrians. 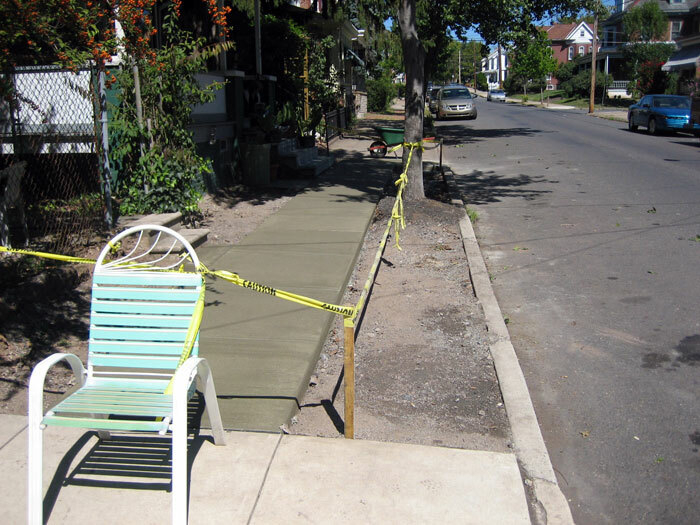 By removing excess concrete, we can absorb far more rain water and make room for more trees. 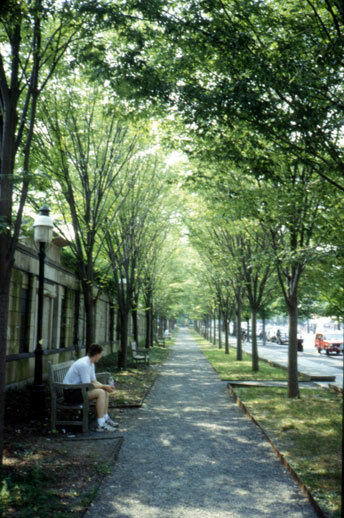 By removing excess sidewalk and planting a double row of trees, downtown Princeton has created a park-like atmosphere on Nassau Street adjacent to Princeton University. 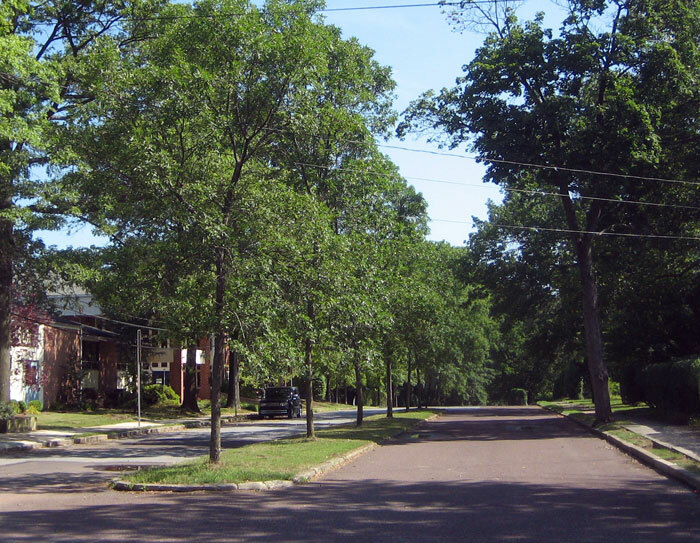 This typical suburban street is about twice as wide as it needs to be. Note there are only a few cars parked on the street in the distance. The houses all have driveways, and there is virtually no traffic on the street. So why so much asphalt? Place a median in the center! 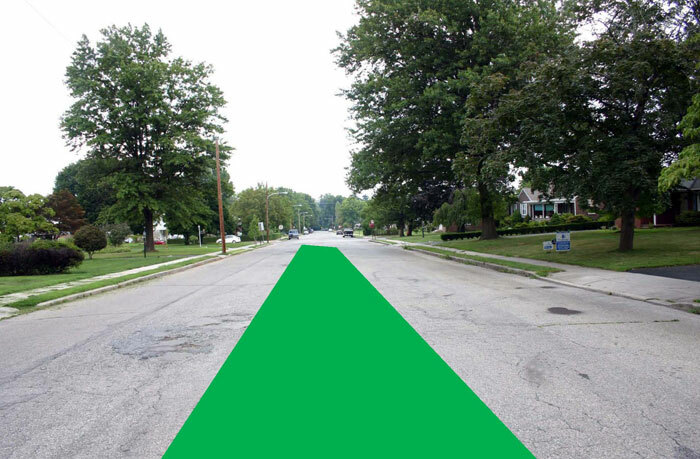 Installing a green median in the center will provide a place for trees, eventually creating a canopy over the entire street. It will slow down auto traffic and increase safety for cars and bicyclists. Notice how a median adds beauty and safety to a street that would otherwise be a wide expanse of asphalt, encouraging speeding and excess storm water runoff. 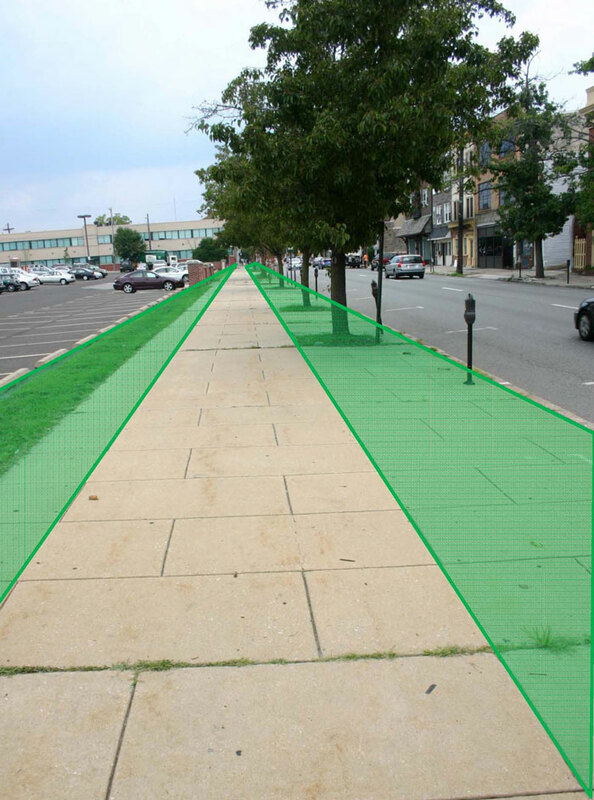 A strip of grass or other vegetated area, often known as a tree lawn, provides a place for trees to grow and provides a barrier between car traffic and pedestrians. These four-foot-wide sidewalks, above, are sufficiently wide for a residential area. 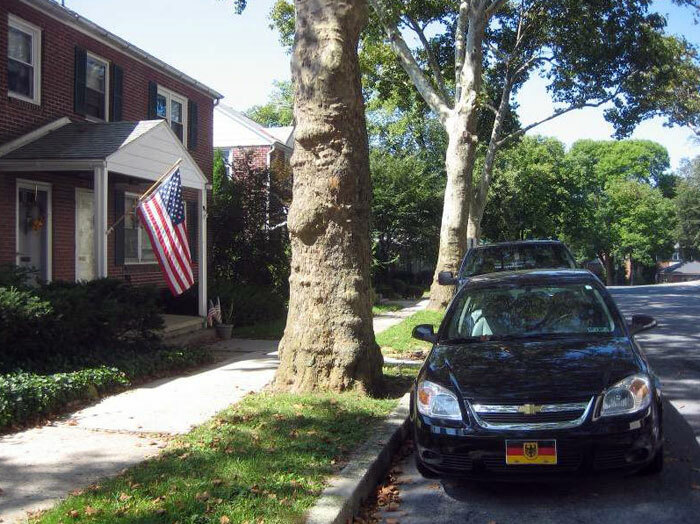 Subdivision ordinances should require tree lawns from five to eight feet wide. Even better would be replacing concrete with bricks or asphalt.